44th Assaults on Mt. Mitchell and Marion ride will take place on Monday, May 20, 2019. 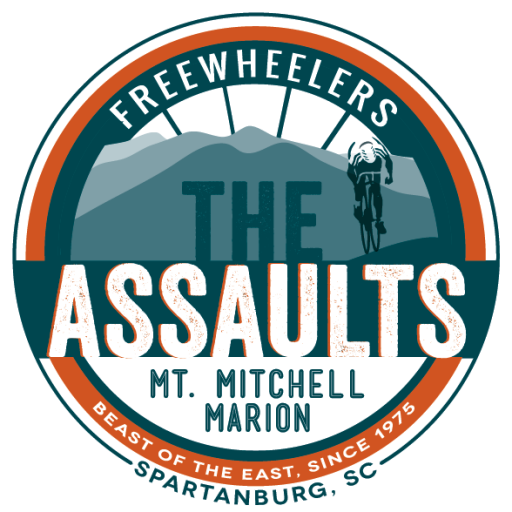 Registration opens on October 24 for the Assaults on Mitchell and Marion. Nestled in the heart of Downtown Spartanburg, Spartanburg Marriott is offering rooms at a special $145 or $155 per night which includes breakfast. The hotel will provide complimentary storage space for guest’s bicycles, wireless internet, and bananas in the lobby during heavy traffic times. The group rate deadline is April 19, 2019. Please call 864-596-1211 to book or visit here. Located off I-85, Courtyard Marriott Spartanburg is conveniently located near Converse College, Wofford College and the University of South Carolina, Upstate and will be offering king with sofa sleeper rooms for $129 per night. The hotel offers high-speed internet and a complimentary breakfast beginning at 4:30 a.m., which will include bananas, bagels, oatmeal, fruit, cereal, muffins, yogurt, juice and coffee. The group rate is April 27, 2019. Please call 864-585-2400 to book or visit here. Experience the art of Southern Hospitality at AC Hotel Spartanburg right on Main St.! This gracious 10-story hotel in downtown Spartanburg, SC curates your best stay. Guestrooms are an oasis of modern design, with sleek furnishings and the amenities that matter most, including free WiFi, wide-screen TVs, private label toiletries, and the most comfortable bed you’ll sleep in besides your own. Rooms start at $145 a night. The AC Hotels are part of the Marriott Hotel family. The group rate deadline is April 4, 2019. Please call 864-585-8900 to book. Residence Inn by Marriott Spartanburg hotel is located just minutes from BMW Manufacturing’s North American headquarters, this All-Suite Spartanburg hotel is a suburban, extended stay hotel and the perfect place to call home whether relocating, attending a corporate event or visiting on leisure. Spacious suites feature luxurious linens, full size kitchens and large work desks where you can stay productive with free WiFi. A studio suite can be booked for $159 by calling Maryanne Charlton at 864-754-4445. The group rate deadline is April 20, 2019. For additional hotel and travel information, visit the Spartanburg Convention & Visitors Bureau website at www.visitspartanburg.com.